The first leg of my trip I was lucky enough to fish with the guide who guided me during my first stay in San Pedro, a few years back. A native from the mainland of Belize. 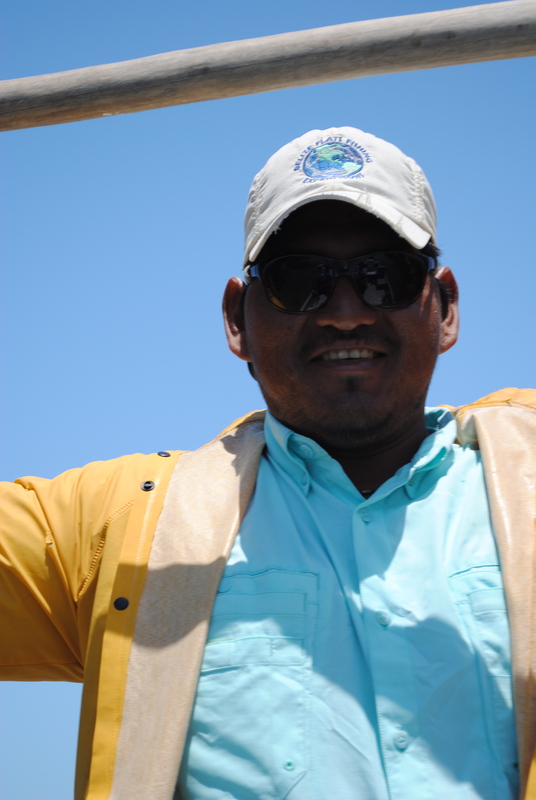 Neftali “ Tayo” Verde, is a young 25 year old who who came from a commercial fishing background in his home town of Sarteneja, Belize. The towns name comes from a Mayan word meaning “taking water from the rock”. Sarteneja is a northern mainland village of 2,500 which is situated on ancient Mayan wells that were drilled through the local bedrock. Sarteneja is also home to some great boat builders who’s products are use throughout the mainland and outer islands. Fishing again with Tayo brought back many memories from my earlier experience in San Pedro, both good and bad. We seemed to pickup right were we left off. ie Tayo yelling out clock positions and distance, and me trying to see the cruising Permit from 200 feet away. Although the fishing is the main reason we travel, getting to know a local guide has so much to offer an angler wanting to know more about the destinations culture, history and local food spots, which is a big plus! After a few days of catching Snook and Bonefish( do I have to remind you of just casting to Permit) we decided to have our families meet up for dinner at one of the local restaurants, Mickey’s which happens to be the oldest restaurant in San Pedro. As we had a chance for us to share stories over a few Belkins (the local Beer) and great local food. We got to hear stories about the Tayo and his wife Alizani’s life in their village, Mayan culture and how fishing for the people of their little village is not just a sport, but a way of life. Few guides in San Pedro have come from a commercial fishing background, a majority have it in their bloodline. ie. Fathers, Uncles, Brothers all have guided on these flats and the newest edition is trying to prove to the rest he can do it as well. As the week moved on, sun blisters began to heal and the tide was right to land a few more hearty bonefish. Since Tayo comes from a commercial fishing background, catching fish was a way to provide for their families, if they didn’t catch fish, they didn’t get paid and there would be no food for the table that night. It was about survival rather then sport, its weird to think a sport for us is a matter of survival for others. Lesson learned. Although the locals are unique I realize traveling to these destinations on the fly is not all about standing on the front of a skiff and slathering sunblock on raw areas. It’s about the full experience and getting to know the people who live there or you will miss it (snap) just like that if you don’t slow down during all the hustle and bustle. During a day off I stopped to eat lunch at a local restaurant just off middle street. With outdoor seating being limited I ask a gentleman if I can sit at his table. Glaring in the sun I try to focus on the conversation and It wasn’t long before he began to talk, and sharing his “story”, how he wound up here rather then Phoenix with the other snow birds. He was a New Orleans native, with a gulf coastal mouth that hasn’t left yet. Called Brother John by the locals, who retired in San Pedro 13 years ago. After hearing from a friend whose wife died and came to the island on vacation and never left. Well, 30 years later Brother John did just this. Sharing his daily life and how on Wednesdays he gets together with his local friends for dinner. He said something to me that stuck in my mind, he told me he “never saw a set of eyes he didn’t trust”. I think as an angler who travels to a 3rd world destination, this is a phrase of hope or comfort for his/her wellbeing. To not see a set of eyes he didn’t trust is a huge comment to make, I mean I cant even say this about people on my block let alone a whole state. The man and I sat and talked for almost and 2 hours, sharing quickly his true love affair for the island and its people. It’s not just one thing really, it’s a beautiful combination of people, scenery, food, nationalities, fishing and all the stories woven in between this mesh of life. Lesson learned, Vacation is another’s home. Later that week, I had gone to pic up some food from another diamond in the ruff Vern’s, a local Garifuna restaurant ,no bigger then a bus stop, on the north side of town. Keeping in mind my dealing in the past with locals, she invited me into your little kitchen and another lesson was soon about to be learned. This past weekend, my fishing partner and I had a chance to fish the Muskegon River with Local Artist, Brother in Christ and Guide Matt Zudweg. A family man who loves his job and the people he meets, Matt is sure to make your experience enjoyable a day on the river and he is a great cook. My buddy John and I have been looking forward to this trip for a month and the time had finally come, after eating White Castles and a few wrong turns we arrive in Newyago, MI and overnight at the Riverside Resort a log cabin style lodge with a laid back country decor to match the unique owner Candy we had no idea what the next day would bring. That next morning, 6:45am on the dot, we were greeted by Matt , he loaded up our rods and headed to the put -in. The Muskegon River is a wide western style river with a classic river, run pool set up. 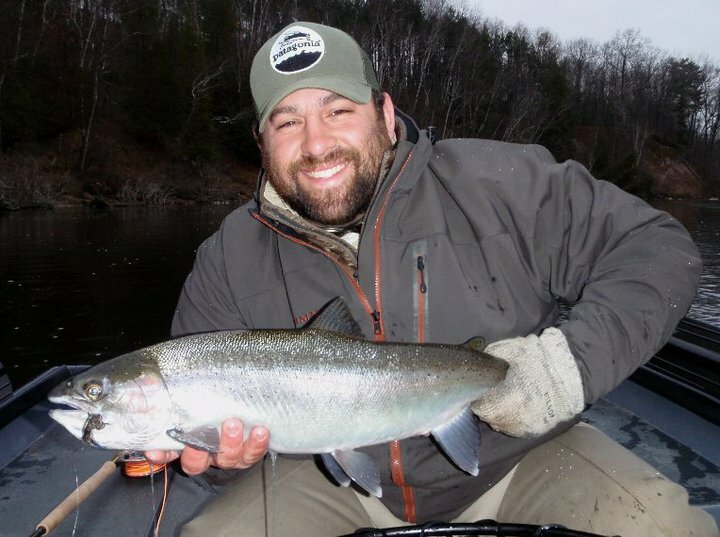 60 miles to Lake Michigan, the Muskegon is home to some of the finest Michigan fishing all year round. 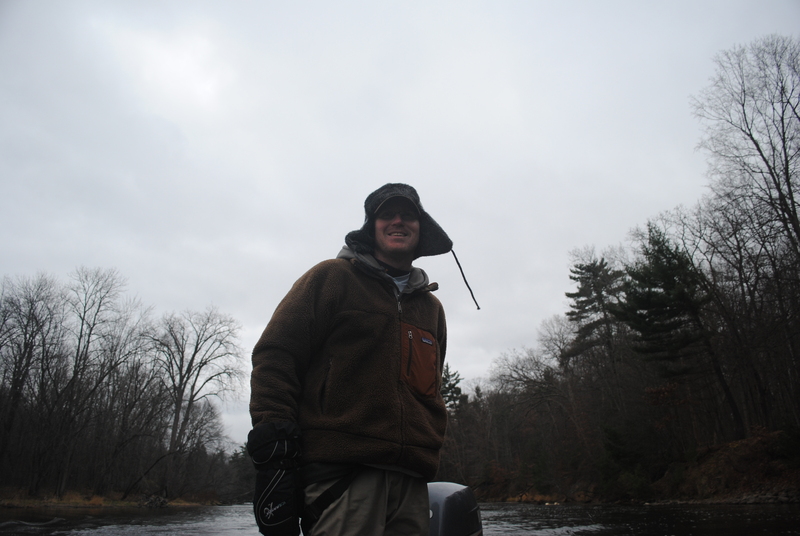 Trout in the spring, Bass in the summer and Lake run Browns, Kings and Rainbows (Steelhead) in the fall and winter. Being a seasoned angler, I had no clue what it was like catch a Steelhead on a swung fly, let alone catch a Steelhead. The sun barely came up that day, with a whopping 40 degrees in the air, it was sure going to be a long day. Not phased by the temperature, Matt began to set us up with a spey rod and rig designed for the Muskegon and swinging large flies. Due to the water level being low, we stuck to deeper pools that would carry fish and concentrated on working the pool throughly and efficient to have an opportunity to catch a Steelhead. Matt seemed to know exactly the point when the fish would strike, when it was best to leave your flies hang for a bit and exactly how the fish would take the fly. (WARNING: IF YOU HAVENT CAUGHT A STEELHEAD LET ALONE ON A SWUNG FLY , THIS IS A MUST.) Working our way down a few pools, I hear Matt say “Where are you Mr. Steelhead?” and a chuckle to follow. We work our way down the Mighty Muskegon and sit on a hole, and within 15 minutes, the fight was on. 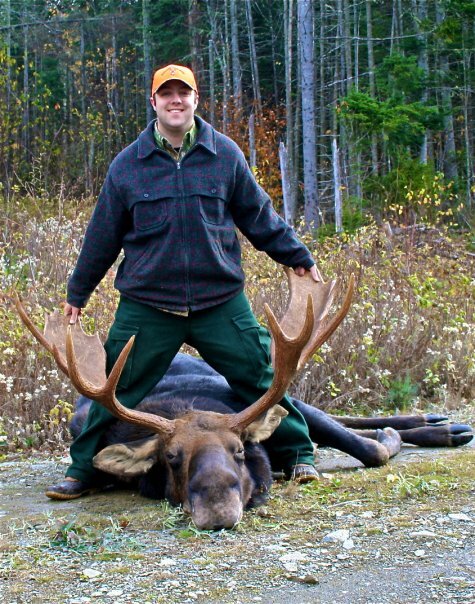 Matt must of made a phone call to Mr. Steelhead that morning. Swinging a fly for Steelhead and catching my first Steelhead was an experience I will never forget. The classic take described by Matt, not to set the hook at first bite, and that you will know when the fish in hooked 100%. Makes me want to relieve that feeling again, along with having Matt’s Steak Sandwich and Grilled Pineapple Riverside. More in on Matt or my trip please feel free to visit the following links.